No one likes ads, but they are a necessary evil in many respects: services we enjoy for free wouldn't be so if it weren't for these paid-for intrusions. Today, however, fast-food chain Burger King overstepped the line, launching a 15-second ad designed to trigger real-life Google Home smart speakers to describe its famous Whopper burger. You can see the spot below, in which the guy holding the Whopper pulls the camera close and pointedly asks, "OK Google, what is the Whopper burger?" The result of this unnatural question is Google Home's Assistant spouting off the first line of the Whopper's Wikipedia page entry, which as The Verge reports appears to have been recently edited to sound a lot more tantalizing than the old one. While admittedly clever, the vast majority of people see the ad as wildly intrusive. Google wasn't involved in making the ad, and as of the last few hours the search giant seemingly disabled the ability for its smart speaker to respond to the televised prompt, likely to the relief of Home owners everywhere. We've asked Google for comment on Burger King's marketing stunt, and will update this story if we hear back. This isn't the first time Google Home has responded to a prompt on TV; during this year's Super Bowl, smart speakers were inadvertently set off when people in a Google commercial said "OK Google". And this also isn't the first time the speakers have been used for promotions; recently some Google Homes reminded users the film Beauty and the Beast had opened in theaters, though Google maintained this wasn't an advertisement. And while Burger King may not have gotten the exact response it wanted with its ad today, the story has generated as much buzz, however negative, as the company could have asked for. This does, however, set a worrying precedent for other marketers who may try to take advantage of Google Home as well as Amazon Echo's inability to distinguish different users' voices. Amazon Echo had its own mini crisis when a news broadcast that said "Alexa" led some speakers to try to order items off Amazon, The New York Times reports. It's one thing to expect ads when you're listening to the free version of Spotify or watching YouTube videos, but it's another to suddenly have a device in your home start talking because of something it heard on TV (which is already littered with ads). There's a level of intrusion into your personal space, of another entity taking control of a device in your home, to sell something no less, that's deeply troubling. Advertisers taking the liberty to control our personal assistants opens a frightening door, one that could lead to alarmingly personal forms of marketing or, at the extreme, even forcing us to buy their goods from Amazon and Google. Though Google acted swiftly to disable Burger King's prompt, it can take a few lessons from the situation. The first is to introduce voice recognition, which would allow Google Home to zero in on specific users, rather than react to prompts uttered by anyone in a room – or on TV. This functionality has been spotted in the code to the Google Home app, so it appears Google already anticipated this need. The second and more tricky lesson is for Google to tell advertisers not to intentionally set off its smart speaker with their commericals. This may happen inadvertently from time to time, but Google could lay out some rules – or at least strong suggestions – that dissuade marketers from taking over devices. Burger King's ad, by the way, is as of this writing in the Trending section of YouTube, the video service Google owns, with over 100,000 views. 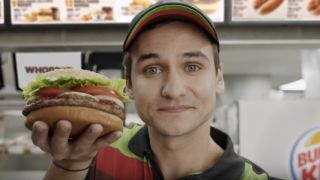 Yes, Google is as reliant on ad dollars as anyone, and though it didn't have anything to do with the Whopper ad, the spot served as much to market its device as a burger. But Google has to weigh what's more important: consumer trust that its products won't turn into marketing shills, or friendly relations with advertisers? After this latest Google Home invasion, the search giant may finally smarten up and make the right choice.